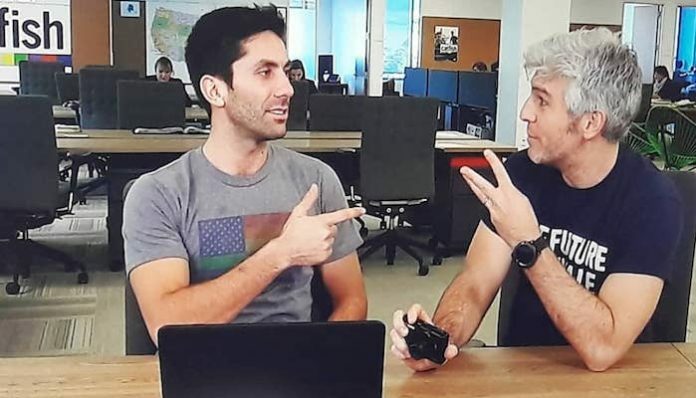 After seven seasons, seven years, Nev Schulman and Max Joseph are splitting up. No, they weren’t dating, no matter how cheeky they seemed together; but Max is moving on to better things. The salt-and-pepper haired co-host is officially leaving the TV show Catfish after Season 7 is finished airing on August 22, 2018. In an interview with People, Max discussed his seven-year career of hosting Catfish: The TV Show while film making. “As sad as I am though that Max is leaving the show, it brings me great joy to know that he is following his heart,” he continued. “I know that unleashing the creativity and passion that he has will benefit so many of us. If you don’t already know about Max’s amazing work as a filmmaker, check out his website maxjoseph.com. Even after seven years, 100+ episodes, and the show recently resuming production after a discredited sexual misconduct investigation, it’s hardly enough to say that the guys have been through a lot together. I don’t doubt that these two friends, brothers, will cross paths in the future, but it will be a hard and long good-bye for them all. There has not been a hint as to who, if anyone, will replace the co-host yet. In the past, Nev’s wife, Laura Perlongo, has stepped in, but with their growing baby Cleo, I’m not sure she will step in full-time. There’s been many who’ve filled Max’s place like Tyler Oakley, Angel Haze, Charlamagne Tha God, Cassidy Wolf, and Alex Shaffer. Who knows, maybe they’ll bring some old friends back on the show?! Catch the latest episode of Catfish on MTV tonight 9PM EST. Be sure to tweet @readunwritten all about your thoughts during the commercial breaks!